In the early 1800s, there were doubts as to the necessity of erecting a lighthouse to mark the entrance of the Portage River. But after a shipwreck at the mouth of the river in 1827, it was decided to erect a light. Even after erecting that first light, the debate as to its need continued. In 1896 a new lighthouse was erected at the end of the breakwater. This structure consisted of a pyramidal shaped wooden building that stood about 26' above water level. Despite early doubts about the necessity of a lighthouse at Port Clinton, the area has been home to three diverse structures, which have served to mark the entrance to the Portage River from Lake Erie. The surviving structures that have been part of Port Clinton’s lighthouse history are now treasured landmarks for Port Clinton. The wooden lighthouse saw service between 1874 and 1964. 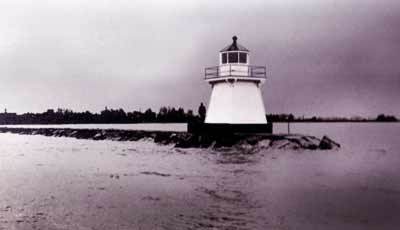 In the 1960s, the wooden Port Clinton lighthouse was removed from the breakwater and relocated to Brands Marina on the Portage River across from Jet Express. The surviving structure has become part of Port Clinton's history a landmark associated with the community. The existing Port Clinton Lighthouse consists of a pair of flashing red and green entrance lights to the Portage River. If you wish to visit the lighthouse, just stop by Brands Marina located on the north side of the river and ask for directions. Remember: this is private property. Be mindful of speed limits and people working in the boatyard. Visitors can see the lighthouse during regular hours of operation at the marina. After the Erie Canal was under construction in New York, the idea of building several canals in Ohio were also being debated. The Ohio and Erie Canal that ran through eastern Ohio had already begun construction. Ideas for a second canal were still being discussed. DeWitt Clinton, the surveyor and driving force behind the Erie Canal was proposing a canal be built from the Portage River and go south to the Ohio River. That canal would be called the Sandusky-Scioto Canal. However, politics and economics put the plan on hold. The Sandusky-Scioto Canal would have gone through Columbus (the new capitol) and Chillicothe (the old capitol) and connect with Ohio River at Portsmouth. Politicians (including important politicians in the Dayton Cincinnati area) said they would be left out of the economic development that the canal would certainly bring to those areas being served. After further study and surveying the engineers decided that there would not be enough water to supply the canal that would have to be built to connect the two rivers. The decision was made to move the 2nd canal further west so it started in Cincinnati, ran up through Dayton and on to Toledo. That canal would become the Miami - Erie Canal. This decision made the politicians in both Central Ohio and the Chillicothe area a bit upset. So the decision was made to change the route of the Ohio & Erie Canal, and have it turn west about midway so that it skirted Columbus and then moved on to Chillicothe and Portsmouth. This made everyone happy except the folks in southeastern Ohio, particularly in Marietta.